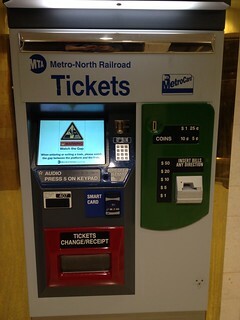 The new Ticket Vending Machine (TVM) Center at Grand Central Terminal contains TVMs that feature SMART Card Readers. 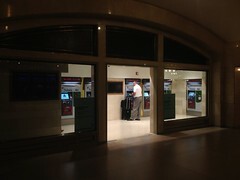 Here is a photo I took of one of the new TVMs at GCT. Note the SMART Card reader below the display screen. This morning I noticed that the long-under-construction new ticket vending machine center at Grand Central Terminal is now open for business. It was due to open in September 2013 so it’s a little early. This new ticket vending machine center is just west of the staffed ticket windows. If you are facing the staffed ticket windows, turn right and walk under the arch. After a months long drought, I found two new Metrocards in the last two days. Both Metrocards were on the ground near Metrocard readers so I don’t know if/where they are for sale. The Grand Central Metrocard seems to have been announced months ago so I’m no sure if it is even still for sale. The Resorts World Casino Metrocard seems to be brand new. NJT's Multilevel Railcars, which may or may not resemble what MNCR may or may not end up purchasing. Many media outlets are reporting this morning that Metro-North Commuter Railroad (MNCR) is seriously considering purchasing double decker rail cars for its Hudson and Harlem commuter lines, which terminate at Grand Central Terminal in Manhattan. One interesting aspect of this idea is that MNCR’s Park Avenue tunnel, which leads to Grand Central Terminal, has more restrictive clearances than even the Hudson (North) and East River tunnels used by NJ Transit and LIRR’s multilevel/bilevel cars. While multilevel trains are typically taller than regular trains, officials in the region have found ways to deal with the narrow clearance of underwater and underground tunnels that provide access into Manhattan. At New Jersey Transit, the bilevel cars feature a sharply beveled roof, which curves at a roughly 45-degree angle to ensure the trains do not scrape against walls. Metro-North engineers believe their trains would require an even steeper bevel to avoid the walls of the Park Avenue tunnel. And low-hanging wires and underground protrusions might have to be trimmed back. Other problems/issues to be considered/resolved may or may not include gapping-out when crossing the switches at Grand Central Terminal, HEP ratings, and locomotive availability. However, as usual, some of these issues, as reported by the media, are either much more or much less complicated than they are making them out to be. Read here what some railfans and railroad employees have to say about all this. Henry Hudson Bridge Pedestrian Walkway has REOPENED! Finally, after three years, the Henry Hudson Bridge pedestrian walkway has reopened to pedestrians and cyclists! What a great connection! And what great views! Here are some quick cell phone pics I took as I walked my bike across the bridge this afternoon. 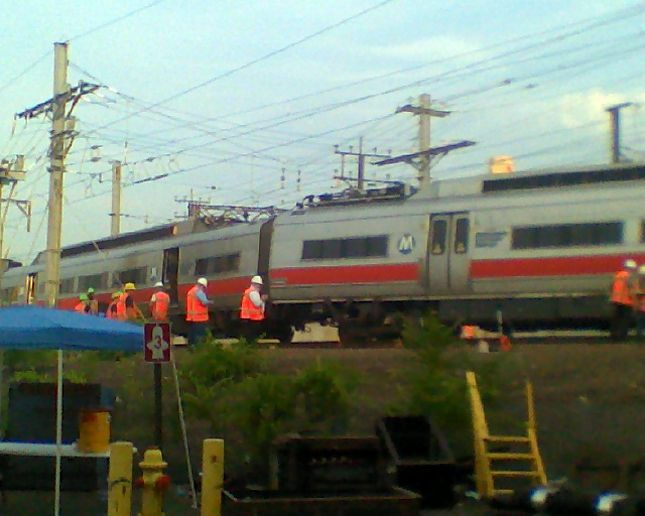 A Metro-North/CDOT electric M.U. 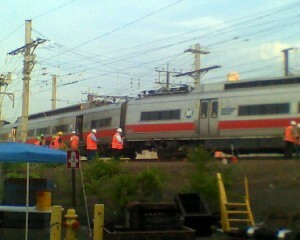 set derailed near the Stamford Yard this morning blocking some tracks and slowing the departure of trains from the yard. As a result service is delayed and conditions on-board are reported to be quite crowded. Photo is from 1010 WINS. Story via MNCR, SubChat, and 1010 WINS. 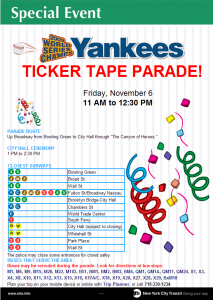 Although the Lexington Avenue line serves the Brooklyn Bridge-City Hall, Fulton Street-Broadway/Nassau, Wall Street, and Bowling Green stations, Yankees’ fans should be aware that the 4 5 6 lines are usually crowded during normal weekday rush hour along the corridor. Instead, fans are encouraged to use the 1 line or the R or W lines to Rector Street, or the E to World Trade Center. 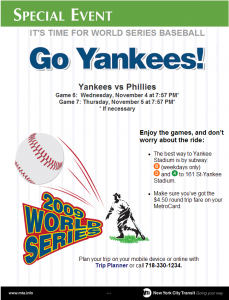 Fans should also consider taking the 2 or 3 lines to Chambers Street or Wall Street, and the J to the Broad Street station. 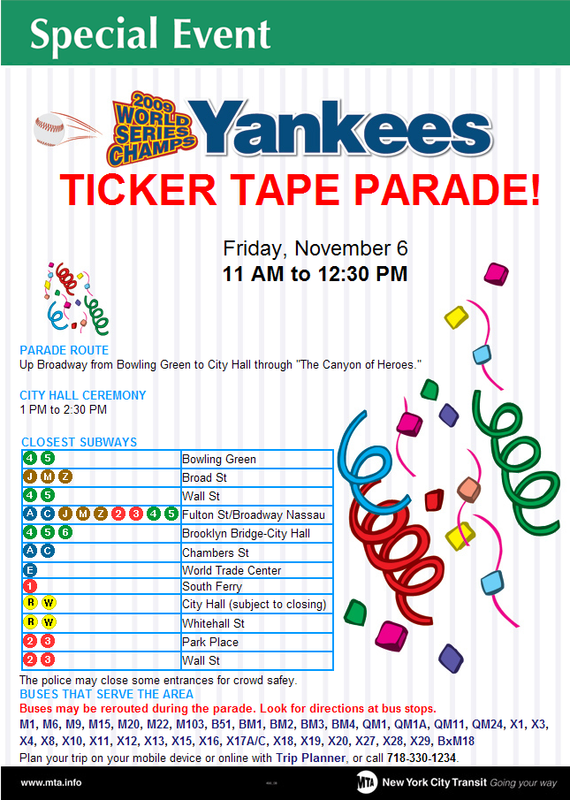 Crowding conditions at the City Hall R and W station, Park Place 2 and 3 station and nearby 4 5 6 Brooklyn Bridge-City Hall station may force trains to bypass those stations during the parade and ceremony at City Hall. All lines affected will be monitored by supervision to ensure smooth operation. 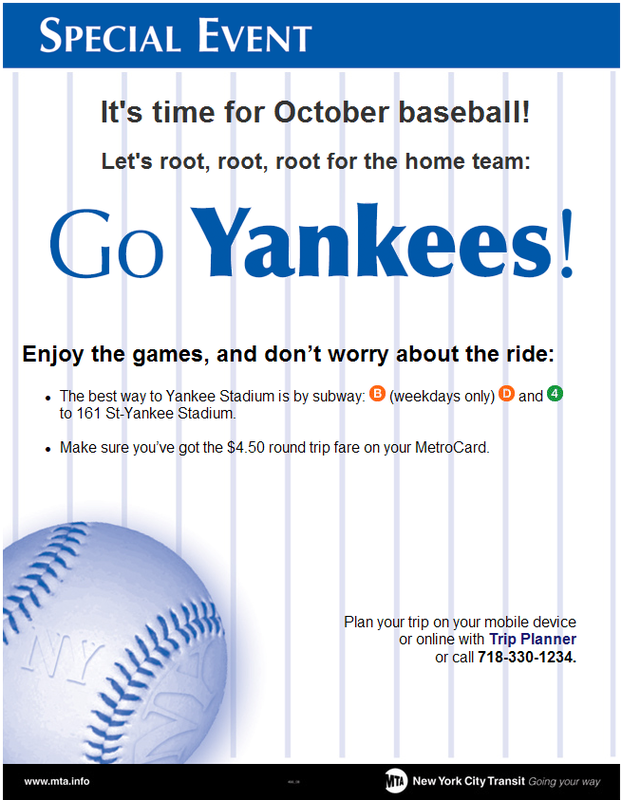 In addition, both Metro-North and the Long Island Rail Road will be running extra trains to bring fans to and from the parade. Click the preceding links for the train schedules. 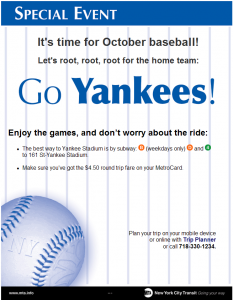 MTA New York City Transit reminds you that taking the subway to Yankee Stadium is the best way to get there. No word yet on whether MTA Metro-North Railroad would dispute that claim. Metro-North has announced that they are FINALLY reviving their Penn Station Access Study. The first part of study, formally called the Metro-North Penn Station Access Major Investment Study/Draft Environmental Impact Statement (MIS/DEIS), was carried out from 1999 to 2002. Since then, it seems it has been dormant. Railfans and transit planners used to speak about it in hushed tones and with tears in their eyes. The “DEIS” part of the study never came to fruition, even though it was promised for “Fall 2003”. Now the study is back in a big way, with an Environmental Assessment (EA) scheduled for completion in 2011. Thankfully “analyses performed to date on [the proposed “Build”] alternative reveal no significant impacts that cannot be mitigated. Therefore, Metro-North has decided to prepare an Environmental Assessment (EA), rather than an EIS.” That should save some time and money. I say that this service can’t come soon enough. For people who work near Penn Station or along the 8th Avenue IND or 7th Avenue IRT subway lines, this service could possibly significantly reduce their commuting times. 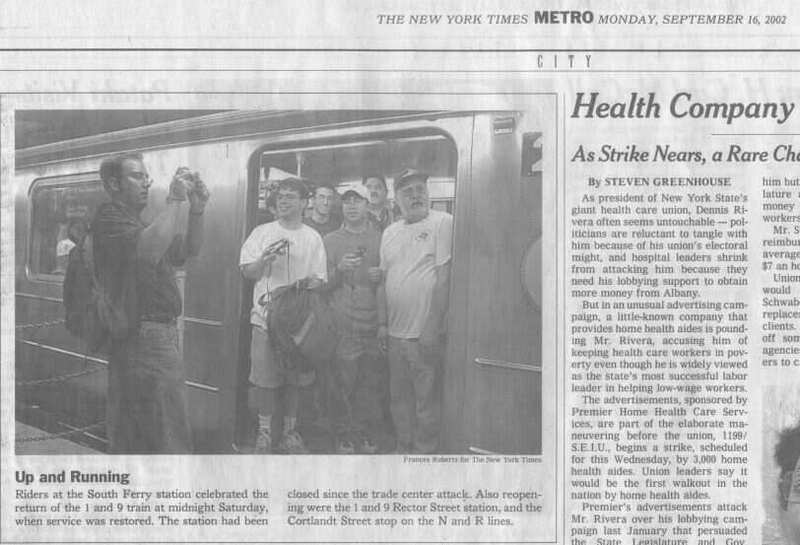 For a lot more information about the work done so far on this project (1999-2002), check out the Penn Station Access Study website on MTA.info. The site appears to have been updated to reflect that the EA will be done in 2011, and with a proposed “Build” alternative graphic that shows the station formerly called “West 59th Street” to now be called “Upper West Side”. 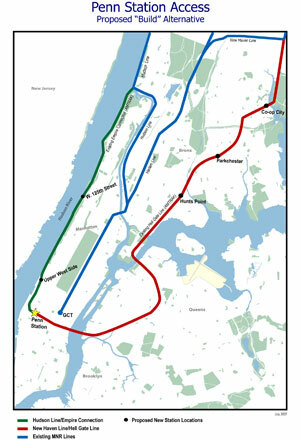 Bonus: a graphic from a past version of the Penn Station Access Study website.